"Given to me by my Cajun aunt. The absolute best I have ever tasted. 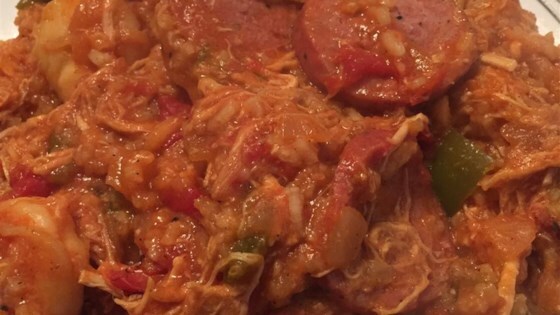 Like true Cajun recipes, the spices do not have measurements, add to taste." Place chicken and sausage in a large pot and cover with water. Bring to a boil, then reduce heat and simmer until chicken is opaque and falls from the bone, 45 minutes. (I usually do this the night before and refrigerate to skim the fat.) Remove chicken and sausage, reserving broth. Shred chicken. In a large pot over medium heat, cook bell pepper, onion and garlic until onion is translucent, adding reserved chicken broth if necessary. Stir in tomatoes, chili powder, pepper sauce, cayenne, Worcestershire and bay leaves; reduce heat and simmer 15 minutes. Stir the shredded chicken, sausage and tomato paste into the spiced vegetables. Continue to simmer until flavor is as spicy as you like, adding reserved liquid as needed to thin. Stir in 1 cup reserved liquid with the rice. Simmer 20 minutes, until rice is tender. Serve or continue to simmer, as desired. It’s so easy to bake the Creole classic! Add a pound of shrimp to this the last five minutes and it rocks.